It is not difficult to be misinformed when mainstream media has clearly chosen an anti-Israel line of reporting. 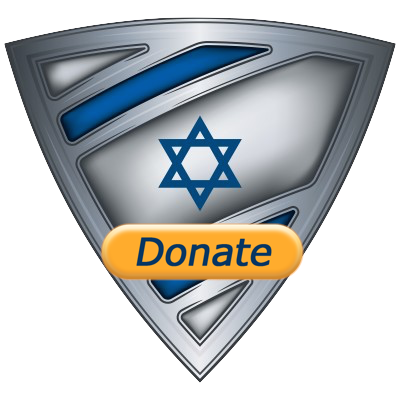 This inexcusable behavior can be seen every time a terror attack hits the streets of Israel. 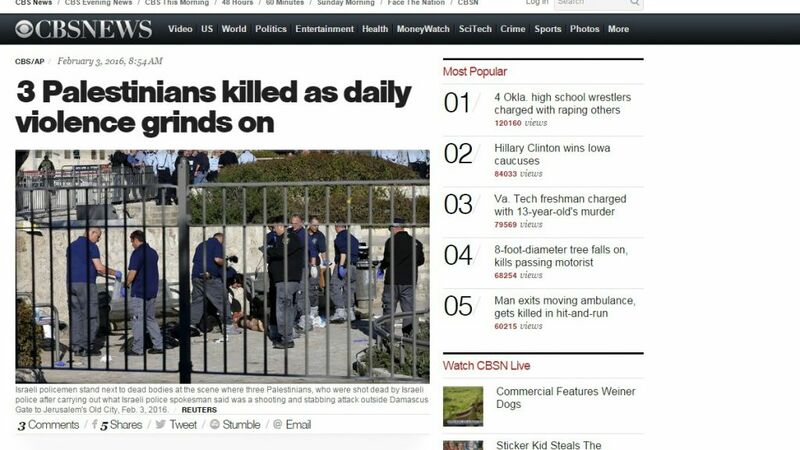 For example, take this headline from the American CBS channel. 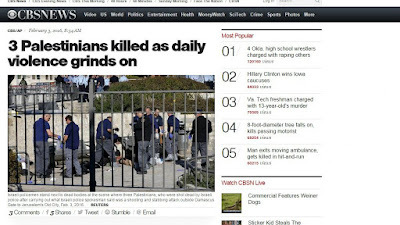 This headline is covering a story of 3 radical Islamic terrorists who opened fire with makeshift Carl Gustav firearms, stabbed 19-year old Hadar Cohen and seriously injured another officer in Jerusalem. Unless one actually bothered to read the article, they would have come to the conclusion that Israel is simply shooting Arabs in the streets. Oh, by the way, they were not Palestinians, they were Israeli Arabs, but hey, why let facts get in the way! It is unreal how some call Israel the aggressor only because we won the wars the Arabs started and then refer to Arabs, who actually started the wars, as the victims. 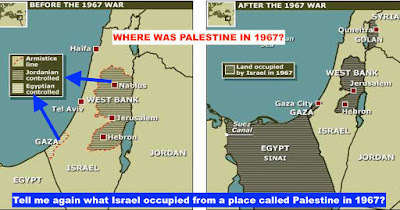 I have written numerous posts on the Palestine Lie as well as on the history, or lack thereof, of an Arab Palestinian national people, so if you are looking for that info, hit the links in blue. Many people claim that the past does not matter and that we have to deal with reality as it is now. I find that claim offensive, immoral and totally dishonest as it ignores the source of this conflict which is based on radical Islamic anti-Jewish ideology. My statement pertaining to the source of the conflict is not based on how I feel, but rather based on simple facts and history. Israel was never and will never be interested in war. 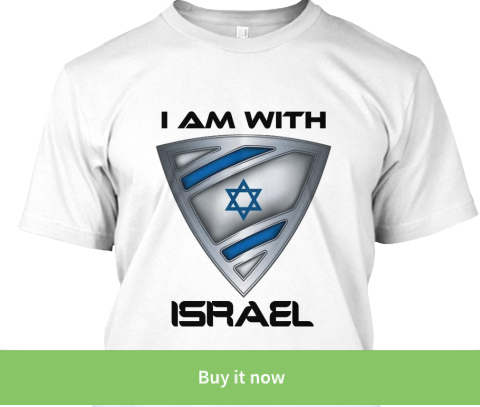 We are six million Jews in Israel and over 450,000,000 Muslims surround us; war is not something Israel ever chooses. The fact is, Israel never started a war and we never called for the destruction of anyone. Israel has only reacted to terrorism and threats of annihilation. Just because we are stronger does not make the other side victims, it makes them stupid for messing with us. I said Jewish radical Muslim conflict because you have never seen a radical Christian or Druze or Buddhist shoot, stab or blow up Israeli buses in order to murder Jews in Israel. 100% of the time the perpetrators of terror attacks carried out against Israel are carried out by radical Islamic terrorists. While Israel's Declaration of Independence speaks of making peace with our Arab neighbors, all the Arab countries that have attacked Israel over the years have called for the total destruction of the only Jewish State in a sea of Muslim and Arab countries. The PLO charter called for the destruction of Israel as does Hamas; Nasser of Egypt called for the total annihilation of the Jewish State as did Syria, Iraq, Jordan and other Arab countries. While Israel is always looking towards peace, the radical Islamic leadership in Hamas as well as in the Palestinian Authority are constantly encouraging war and violence. 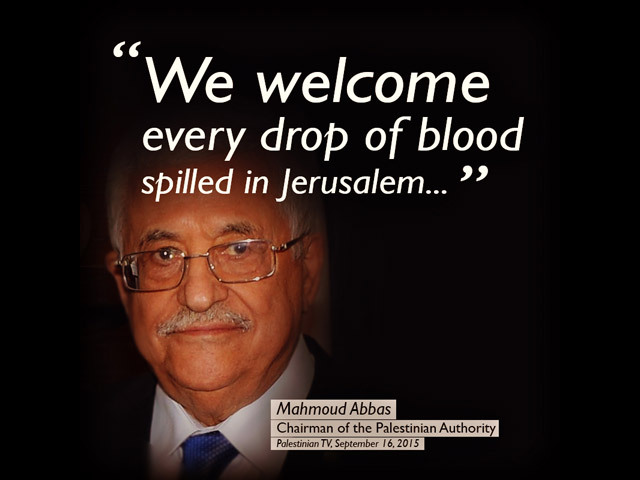 You will NEVER find Binyamin Netanyahu praising the murder of anyone and yet here is what Abbas (the moderate) has to say in reaction to the radical Islamic terrorist daily knife attacks on random Jews in Israel. Leaders often make stupid remarks, but when religious leaders and kids TV programs spew hatred and violence against Jews, that should be sufficient for anyone who thinks Israel is the problem to change their minds. Go ahead! I dare you to find an Israeli kids show that would be left on air for an hour after running something like this. This is the worst kind of child abuse and all the liberal anti-Israel activists couldn't care less. The problem is, this is just the tip of the iceberg! Some of the kids cartoons are taken right out of Nazi propaganda and lead to murder. Then of course there are the religious leaders. I have yet to hear the Islamic public anywhere in the Middle East demand the resignation of religious leaders like the ones below. What is interesting about the videos above is the fact that none of them mentioned the 'Green Line', settlements, occupation or Zionism as the cause for their hatred of Jews. While it is true that there are many good and peaceful Muslims, those are not the ones Israel ever had a problem with. The real moderate Muslims not only don't have a problem with Israel, they are our greatest friends! I know, I know, it is because of the occupation and if there were no settlements, there would be no hate. I am so happy you say so, because the 15 quotes I am about to show you will help you understand just how untrue that statement is. Here are a collection of statements made by Arab leaders before the 1967 war, when all the "disputed" areas of today were in Arab control and there were no settlements. Seems like the settlements are not the real obstacle to peace! 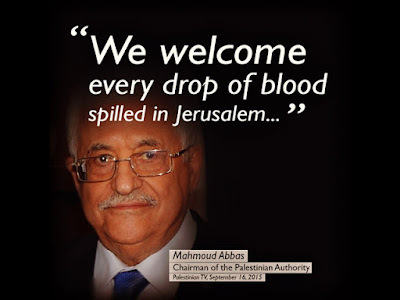 May 19, 1967: "This is our chance Arabs, to deal Israel a mortal blow of annihilation, to blot out its entire presence in our holy land"
May 22, 1967: "The Arab people are firmly resolved to wipe Israel off the map"
May 25, 1967: "Millions of Arabs are ... preparing to blow up all of America's interests, all of America's installations, and your entire existence, America." May 27, 1967: "We challenge you, Eshkol, to try all your weapons. Put them to the test; they will spell Israel's death and annihilation." May 30, 1967: "With the closing of the Gulf of Akaba, Israel is faced with two alternatives either of which will destroy it; it will either be strangled to death by the Arab military and economic boycott, or it will perish by the fire of the Arab forces encompassing it from the South from the North and from the East." Find me an Israeli Prime Minister that ever called for the annihilation of another people. Remember these statements were made when Jerusalem, the entire West Bank, all of the Gaza strip and the Golan Heights were in Arab control. 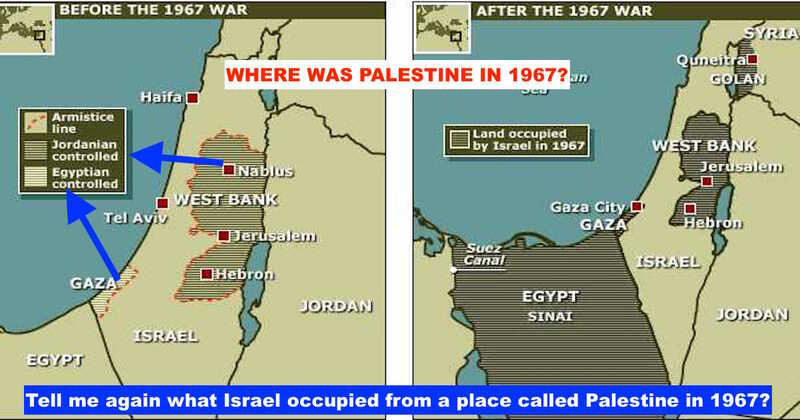 So, we see that the conflict did not start in 1967 and when it did start it had nothing to do with settlements or occupation. We see leaders, TV shows and religious leaders explain time and time again that the hatred for Jews is based on radical religious beliefs and has absolutely nothing to do with a national Arab claim. We see the radical Islamic leaders calling to murder Jews, teaching kids to hate and murder Jews and rewarding the murder of Jews. My question for all of you out there is simple: based on what track record or history would one think a deal with those who seek Israel's destruction is justified? How is a Two State solution that takes more land away from the very tiny Jewish country and hands it over to the Arabs who already rule over the entire Middle East considered justice? How would you define the reason for the conflict in the Middle East? What would be your solution? Help get the TRUTH out there, please Share and comment below!